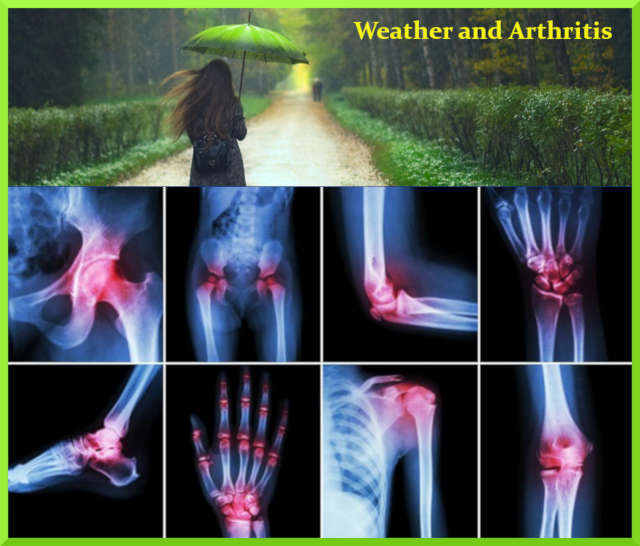 Home / #AmericanRoadRadio / #Health / #Healthcare / Health / #Health : Does weather affect arthritis pain? #Health : Does weather affect arthritis pain? Medical myths die hard. Maybe that’s because there’s no agreement on whether a common belief is indeed a myth. For example, there’s the longstanding belief that weather affects arthritis pain. Many of my patients notice a clear connection; some are so convinced of the link, they believe they can predict the weather better than the TV meteorologists. And maybe that’s true. But that’s not what the science says. A recent study finds no connection between rainy weather and symptoms of back or joint pain. This conclusion was based on a staggering amount of data: more than 11 million medical visits occurring on more than two million rainy days and nine million dry days. Not only was there no clear pattern linking rainy days and more aches and pains, but there were slightly more visits on dry days. Still not convinced? That’s understandable. Maybe it’s not rain or shine that matters — maybe it’s barometric pressure, changes in weather, or humidity that matters most. Or maybe the study missed some key information, such as when symptoms began or got worse — after all, it can take days or even weeks after symptoms begin to see a doctor. What does past research say about weather and arthritis pain? The question of whether there’s a link between weather and aches and pains has been studied extensively. While a definitive answer is nearly impossible to provide — because it’s hard to “prove a negative” (prove that something doesn’t exist) — researchers have been unable to make a strong case for a strong connection. For example, a 2014 study in Australia found no link between back pain and rain, temperature, humidity, or air pressure. This study collected data regarding features of the weather at the time of first symptoms, and compared it to the weather a week and a month before. But, an earlier study found that among 200 patients followed for three months, knee pain increased modestly when temperature fell or barometric pressure rose. Does research matter when you have personal experience? That’s a fair question. And it’s something I’ve even heard in TV commercials about headache medicines: “I don’t care about the research. I just know what works for me.” But it’s worth remembering that humans have a remarkable tendency to remember when two things occur or change together (such as wet, gloomy weather and joint pain), but remember less when things do not occur together. That rainy day when you felt no better or worse is unlikely to be so notable that you remember it. If you rely solely on memory rather than on more rigorous, data-based evidence, it’s easy to conclude a link exists where, in fact, none does. It’s true: medical myths die hard. In fact, some seem immortal. One could argue that’s as it should be. After all, yesterday’s medical myth is only one discovery away from becoming tomorrow’s medical fact. Still, when the evidence is compelling, I think we’d be better off letting go of what’s been disproven, give more credence to evidence than folklore, and keep an open mind — just in case the evidence changes. When my patients tell me they can predict the weather by how their joints feel, I believe them. It’s hard to discount it when so many people notice a connection. They could represent an exception to what the studies show. But I also believe the science. Until I see evidence that’s even more compelling, I remain a skeptic about the weather/arthritis connection. Follow me on Twitter @RobShmerling. The post Does weather affect arthritis pain? appeared first on Harvard Health Blog.